Prospective college students are already using their mobile devices to upload Facebook photos, update Twitter, and text their friends. Now, colleges are beginning to use smartphones, too — as recruitment tools. YourCampus 360 is one company using iOS and Android devices as platforms for a full-blown college tour and information business that hones in on the trend of readily available location data and the prevalence of smartphones. 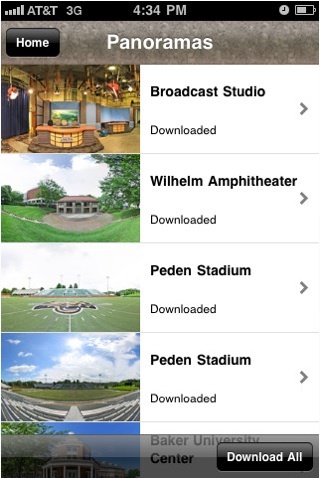 YourCampus 360 already does virtual tours via the web and Facebook of colleges and universities. Recently it began offering mobile apps to help colleges find students wherever they happen to be. Can’t afford to go on a college tour trip? This service is intended to be a replacement for the experience. But prospective students can also use the app to make their in-person tour more interactive. The company mixes GPS with custom maps it builds for each school and creates an app that gives guided mobile tours with audio via an Android (s goog) and iOS (s aapl) app. When students arrive on campus at one of the 70 participating schools in the U.S. and Canada, instead of receiving a map or having to take a guided tour, they are invited to download the school’s iTour app on their iOS or Android device. If they don’t have one, some of the schools even provide a loaner device. As students and their families make their way around campus, they can choose from a variety of tours tailored to the course of study they plan to pursue (for example: tour for athletes, or tour of just the engineering buildings). There are also passive notifications of relevant information based on the device’s location on campus. 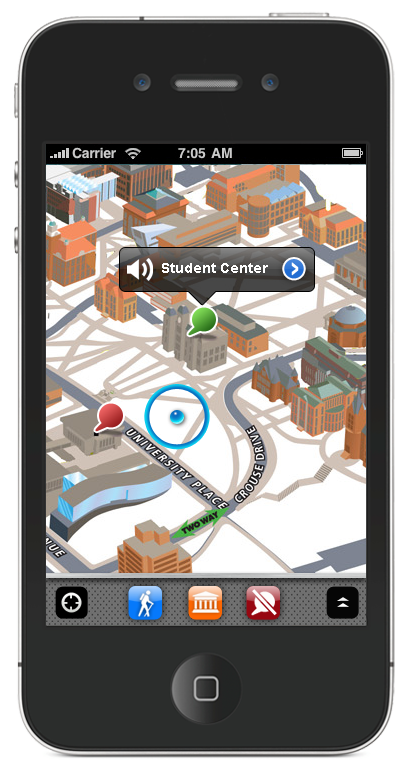 When a student comes within 20 yards of a building, the app’s audio portion will kick in and begin talking about what happens in that building. From a business perspective, one of the main benefits is that the app “creates multiple touch points between the school and the prospective student,” he added. The hope is that schools will use that connection to stay in touch with students after a visit or a display of interest in applying. Stony Brook University in New York noticed a 200 percent leap in the number of students accessing its admissions page via iOS devices and last year began offering YourCampus 360’s customized tour iOS app to its prospective students. “Mobile is where it is if you want to reach out to potential students,” said Stefan Hyman, web and electronic information coordinator for the school’s undergraduate admissions office. Though the technology schools are using to recruit students has changed dramatically in the past few years, Hyman says the information that students want remains constant. Since they’re searching for that in new ways, it makes perfect sense to meet them there. The other thing that’s changed is the economy, which is part of the reason Stony Brook was interested in this new mobile student outreach method. “So students have this option of taking a tour online or downloading the app if they don’t have the financial means to come for a physical visit,” Hyman said. Lending evidence that it might be working is the data they have on who is getting this app. Just in the last three months it’s been downloaded 3,300 times, and not just in and around New York state, but in 28 additional countries. I can understand how this would be beneficial for those who can’t make it out to the campus, but why would you use it if you are on campus? Wouldn’t having an actual tour guide who can answer questions on the spot be more beneficial than looking at it on your phone? It’s not like an audio tour at a museum, if you will be spending money for four years of your life you want all your questions answered before you commit. iPhone 4,two front facing cameras?